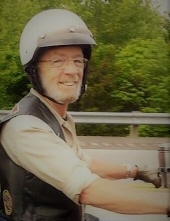 David Wayne Hayes, 61, of Elizabethtown passed away Saturday, February 2, 2019, at his home. He was a tool maker for Fishbach USA, and a member of the American Legion Post 113, the American Legion Riders and the Patriot Guard Riders. He also was baptized at Northside Baptist Church. He was preceded in death by his father, Charles Albert Hayes. Survivors include his wife, Maria Hayes; son, Diogo Jose Silva Fernandes; daughter, Beatriz Samaritana Lebreiro Fernandes; mother, Barbara Spradlin; two brothers, Charles Alan and Bobby Gene Hayes and one grandchild, Maria Leonor Lebreiro Mateus. Services will be conducted at 7:30PM Tuesday, February 5, 2019, at Dixon-Atwood & Trowbridge Funeral Home with Bro. Kevin Roberts officiating. Visitation will begin at 6PM Tuesday at the funeral home.#113. To plant a tree in memory of David Wayne Hayes, please visit our Tribute Store. "Email Address" would like to share the life celebration of David Wayne Hayes. Click on the "link" to go to share a favorite memory or leave a condolence message for the family.